When I first received the copy of this anthology, I knew that I could not review this one alone. I am always conscious of the fact that, as a male-identified person, I have a very different experience in the world and in the communities I am part of. Normally, I try to read books and write reviews with that in mind and seek out some other perspectives when necessary. But with a book that is about consent and the cultural problems with how it is handled in our society, well, there was no reasonable way for me to take the lead. So instead, I brought in two of XCBDSM’s female writers/educators to read the book and give their perspective. While I certainly have my own thoughts and reactions, I will let their voices take the mic here. Update: An excerpt of this review appears on the first page (or first few pages if you are reading on a small device) of both the print and digital editions of “The Game Changer”. I am honored. 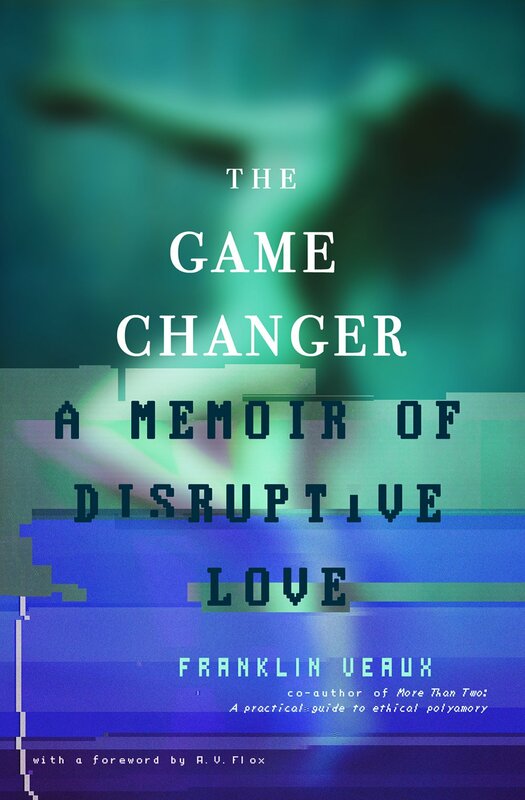 “The Game Changer: A Memoir of Disruptive Love” is the new book by Franklin Veaux, co-author of “More Than Two“. If you haven’t read his first book, yet, click on the book title in that last sentence, read my review, and go buy yourself a copy. I was incredibly excited to get to read the book in advance of its release this September. To get your copy, click on the image below to pre-order. I finished reading the book less than 24 hours after I received it. It is a compelling story about a fascinating individual. So at its core, it fulfills the requirements of a good auto-biography. Beyond that, it is well-written and structured in a way that gives the reader a great sense of the passage of time and the growth of the individuals across the years. The author successfully portrays both his old and new ways of thinking, and does a great job of connecting the threads between them in a way that really helps you to see the bigger picture of his journey. I was struck by how much I identified with both the author and his struggles. I expressed to others that it was reassuring, in a way, to read about someone like him feeling frustrated and lost and hurt, because I have felt that way. So if he could find his way through the fog and find happiness, then so can we. And if nothing else, at least we know that there someone else out there who understands what the fog feels like. That alone feels really good. While “More Than Two” inspired me to think about relationships differently and to approach those around me with a new level of compassion and honesty, “Game Changer” instead serves as a source of hope, assuring you that those efforts are worth it. Veaux is someone who I have often held up as a sort of alternative relationships guru (a feeling that was entrenched when I read More Than Two), but in this book, he shows that he has, for much of his life, been just as lost and confused as I have often felt. In school, I always remember being frustrated in math class. On tests, I would look at a problem and be able to tell you the answer, but I was also required to ‘show my work’, demonstrating how I arrived at the solution. I always felt that having the solution was good enough, but others wanted more from me. If “More Than Two” was Veaux’s solutions to poly problems, than this book is his way of showing his work. A lot of us, myself included, wanted to know how he reached the conclusions that he has about relationships. A lot of us agreed with him, but still wanted to see the process laid out. This book does that in incredible and painful detail. One of the really beautiful elements of this book is the way that they are able to bring you into the room with them and feel things. I teared up more than once as they story progressed, at one point in particular, I couldn’t help but feel a deep sense of remorse for the moment that he describes as one of the three worst moments of his life (all three of which happened in cars). I don’t mind admitting that I get emotional when I read sad things, but only when the story-teller is successful in making me care, which he seems to do almost effortlessly. Veaux’s descriptions of small, random moments of joy and connection, which might seem like trivial details in such a big story, provide a crucial sense of humanity that regularly reminds the reader that everyone involved in the story are real people. And despite their quest for non-standard relationships and even enjoyment of the occasional whips and chains, they also enjoy watching puppies play in the park, or turtles ride on the backs of alligators, or snuggling quietly with someone you love. His larger world views bleed through in many of the smaller moments. After reading the above passage early in the book, I remarked that the book was secretly about way more than just poly. Several more times, throughout, I found myself highlighting and bookmark ideas that he gave such wonderful voice to, even those that were not just about relationships. This, I think, is the most important line in the whole book. It is the moral of the story, I believe. It transcends the world of poly, too. In how many ways to we solicit promises from others around us only to allay our own fears and insecurities and fool ourselves into feeling safe? How often in our lives do we allow commitment and obligation to be our security blanket, rather than ensuring that we constantly earn the loyalty and love of others around us? Whether you identify as polyamorous or not, I think that idea is one worth considering. That idea is why I recommend this book without reservation. If I had any complaint about the book, it would be that the title doesn’t quite match the content. On page 2, we are told that the book is about his first game-changing relationship, yet that person, Amber the Dragonslayer/Giraffe/Game Changer, is not introduced to us until the last 60 pages. While the title of the book is “Game Changer”, a term and concept that are explored in-depth in “More Than Two”, 75% of this book is about the time before he met Amber. Instead, the book seems to follow his relationship, from beginning to end, with his ex-wife. That isn’t a bad thing necessarily. As I said before, that depiction of struggle is one of the things I value most about the story. It is simply that I expected, based on the title and introduction, to read more about that radical, game-changing shift in thinking and the ways in which his life changed afterward. It would be like if Avengers 2 was titled “Age of The Vision” and then we all left disappointed that most of it was about Ultron and The Vision didn’t show up until the end. That would not have made the movie any less awesome, though, and “Game Changer” is still a great book, despite this small disconnect. So, my major gripe is that the story ended before I wanted it to, but I think that really says a lot about how compelling it is. I truly devoured the book and I look forward to sharing it with others this autumn. I would definitely tell people to read “More Than Two” first. But for those that bristle at ideas in it, such as the rejection of veto policies and the elevation of the status and rights of secondary partners, this book fills in some of the necessary gaps and explains why he believes so strongly in those things, which (in spite of how the high school version of me felt about showing your work) is probably just as important, if not more-so. In many ways, this book may serve as a short-cut, allowing readers to learn from Veaux’s experiences and mistakes, in lieu of making their own, and avoid many of the pitfalls that people beginning their exploration of poly often fall into. … And his geekiness makes me smile. ModernPoly.com has published my review of “More Than Two” by Franklin Veaux and Eve Rickert. This is my second article featured on that site. Hooray! UPDATE: This review was quoted and linked from the “More Than Two” blog HERE. Yay! The short version is that I am 100% in love with this book and highly recommend PURCHASING IT HERE. I began reading the book expecting it to be good. I expected to read a lot of things that I already knew, though perhaps articulated better than I had read before. I have read a lot of Veaux’s writing and I know that he knows the subject as well as anyone. I planned to highlight a few passages to quote in the review and say some nice things about it. Inspired by Raven Kaldera’s The Eightfold Path to Altered States of Consciousness, which is reproduced in the Appendix, Lee Harrington clearly draws from Kaldera’s work in Northern Tradition Shamanism and applies it to Sacred Kink. No, I will not be addressing any critics of Kaldera’s Shamanism work, there is a time and place for such shenanigans. This is not it. Also, I do not walk that path so I don’t care.